Muriel Hopkins was born and raised in Baltimore, Maryland. Music was her first love. She started taking piano lessons from the Peabody Preparatory Institute when she was six years old and graduated when she was fourteen. She studied piano with Charles Sprenkle, piano and harpsichord with Hugh O’Meagher, and finished up her Preparatory studies with Julio Esteban, a Peabody Conservatory professor. 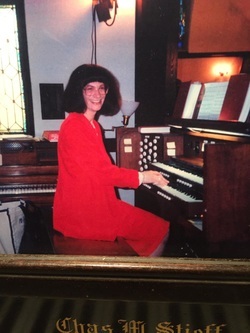 She studied pipe organ for two years with Eugene Belt (a Gettysburg College organ professor) at Brown Memorial Presbyterian Church on Park Avenue in Baltimore. She became a church organist when she was sixteen years old. She returned to Peabody and studied Pipe Organ with Arthur Howes in the Conservatory, for two years. She also has degrees in Music Education, Organ and Piano Performance from Towson University where she studied organ with Dr. Thomas Spacht, piano with Prof. Reynaldo Reyes, harpsichord with Prof. Richard Schroeder, and jazz piano with Prof. Tim Murphy. She has served as organist, pianist, music director and accompanist for many different churches, faiths and schools. Many of her piano and organ students have become church organists, music performers and educators. Muriel is presently the principal organist at The Basilica of Baltimore, where she is also the wedding and funeral planner. She is the Choir Director and Organist at Calvary Baptist Church in Towson, MD and Saturday Music Director/Organist of Our Lady of Pompei Church in Highlandtown, MD, where she is also the wedding and funeral planner. Muriel lives in the Glendale Community of Baltimore County, near Towson, with her beloved husband Eddie, her dog Plato, and Siamese cat Socrates. I teach because I want to share my enthusiastic love of music with everyone! Music makes our hearts sing: we have a natural need to express ourselves through music. I strive to help my students experience the joy that music brings by helping them to create beautiful sounds on the piano. I teach them to learn and interpret musical scores, to understand the history and times of the composers, to analyze the theory behind the music. My goal is to provide my students with a positive learning experience and the inspiration to study and perform their pieces to their personal satisfaction, as well as to the delight of those hearing them play. What levels of students do you work with? I strive to challenge my students to be the best that they can be. I work with students of all ages, from 3 years old to 85 years old, ranging in ability from new beginners to advanced students in need of coaching. What do you focus on in lessons? I help my students to attain the technique necessary to play the piano with facility by introducing scale playing, arpeggios and technical studies such as Hanon in a way that enhances the pieces they are studying. I teach music theory, history, ear-training and ensemble techniques through playing duets with the teacher. I also encourage my students to memorize their pieces in order to improve their minds and also to be able to play in recitals and impress their friends. I introduce my students to music written by composers throughout the ages, from the Baroque Period, Classical, Romantic, Contemporary, Jazz, and Popular eras. I choose musical selections depending upon the students’ interests, abilities, goals and technical needs. How do you help your students learn new concepts? I enhance each lesson by adding ways of approaching the music "off the keys." This includes clapping and counting the rhythm of the piece, counting and playing, counting and saying the finger numbers, counting and saying the names of the notes, and making up words for the pieces. I also enjoy transforming some students' pieces into duets for us to play together. How do you grow as a teacher? I continue to learn and grow as a teacher by learning from master teachers as well as from my students. I also attend recitals and listen to many recordings of music performed by world–class musicians.